Today I tested a not very popular lead brand, Stabilo. 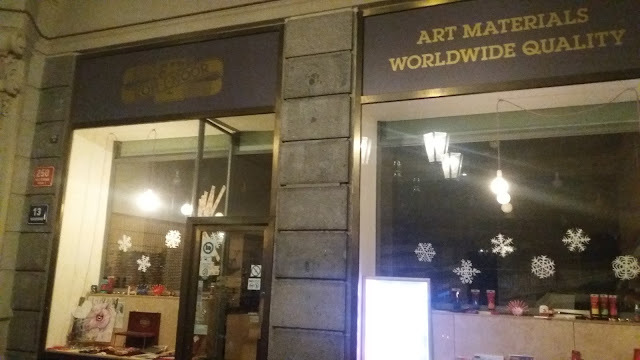 The brand is best known for its highlighters and I would say not so much for pencils and leads. The price of the lead was pretty good. 1.63 $ or 1.32 Eur for 3 pack of 12 leads. Two of them HB and one 2B. It is cheaper than big brand names in some cases even by half. The lead comes in a classic barrel, that is clear with a little quirk to it and a nice red cap. I like the simple and clean look. The first thing you notice is the length of 75 mm instead of the standard 60 mm. So not only you have a better price than bigger names you get more lead for your money, 25% more. 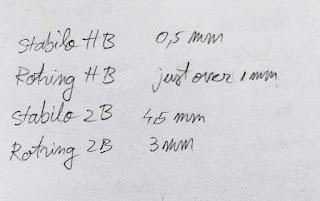 I tested the 0.5 mm HB and the 2B. To have a base point I compared the results produced by the Stabilo to Rotring. The lead writes well, the HB feels a bit hard and a bit scratchy. I would give it a 3 out of 5 stars. The line is a bit light. It feels a bit harder compared to other HB leads. Compared to the Rotring it feels very hard, but the pro is the ease of erasing it. After doing the writing test for the HB I used about 0.5 mm of lead. The good thing is the lead will last a long time, and you will not need to click the advance mechanism so often. The Stabilo 2B is very soft and smooth. It leaves behind a black dark line but wears up quite fast. 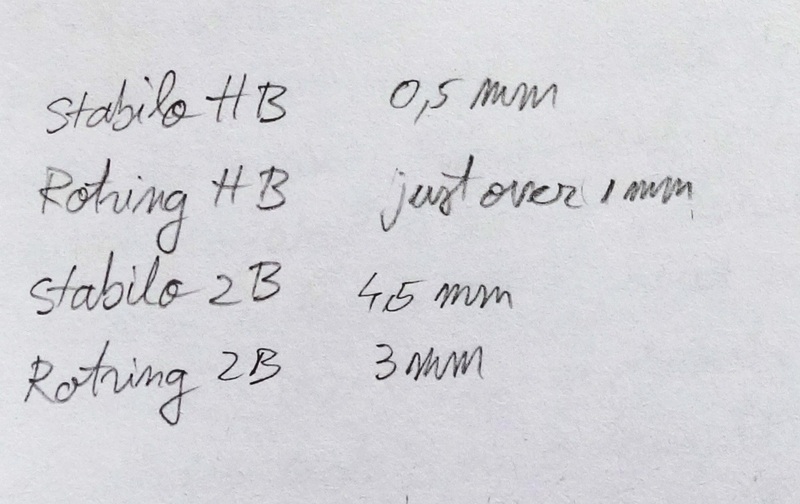 The same writing test used 4.5 mm of lead. A very significant increase. You will have dark lines on the paper but you will be clicking a lot. The erasing of the lead was very good, no residue was left behind. But the Rotring 2B did better overall. It was a hint darker but nothing significant or worth worrying about. The smoothness was similar in both brands. 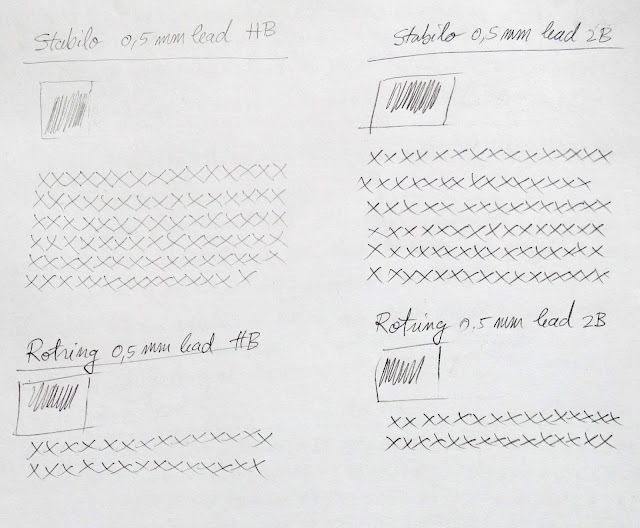 But Stabilo needed 4.5 mm to do the same test while Rotring needed only 3 mm. The Stabilo 2B seems too soft, and this does not translate into extra dark lines. So I would not recommend it, as you will have to do a lot of clicking to write. There is a definitive gap between Stabilo HB and 2B. HB being a bit too hard and the 2B a bit too soft. If you are not put off by the hardness and scratchiness of the HB, Stabilo offers a very good deal. 75 mm of lead, 12 leads/pack at just 0.44 Eur or 0.54 $.